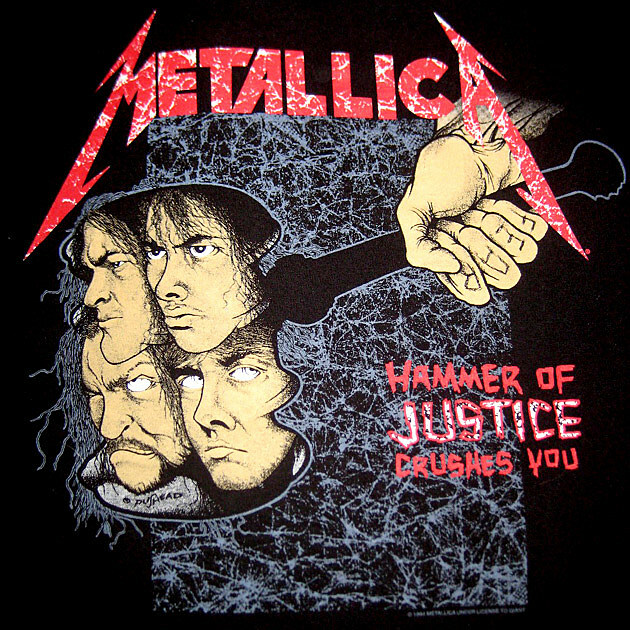 Metallica: The First Four Albums - "...And Justice for All"
The more I listen to this song, the stranger it seems. On one hand, it’s friggin’ epic. It’s 9:46 long. The opening riff screams “epic”. A riff that regal is a statement of intent. It says, “Much more is coming, and it will be grand”. You can’t just pound out a song after that intro. You have to untangle its coils and work them out. We are very far away from Kill ‘Em All. On the other hand, what seems epic is really quite digestible. The song is mid-paced and very playable. None of the riffs are that technical. What seems like a progressive opus is really just a linkage of blocks. Granted, there’s 9:46 of blocks, which is a strange thing for a band on top of the world to construct. Before bands confused “long” with “epic” in emulating Metallica (hello, Machine Head), they wrote for the stage. This got more true as they got bigger – see, e.g., Judas Priest’s simplified ’80s approach. Metallica did write for stadiums with the Black Album, but they were already playing stadiums with Master of Puppets (see the photos in that record’s liner notes.) Even though “Master of Puppets” and “Welcome Home (Sanitarium)” are pretty involved, it’s a big step from those to an almost-10-minute song that never peaks. This aspect is what fascinates me most about the song. The last time we heard an “in-between” (not fast or slow) Metallica song was “Leper Messiah”, which still found time for a conventional metal gallop. “…And Justice for All” offers no such accessibility. Riffs iterate and repeat almost like Morse code – one hit, two hits, three hits, four hits. Do it again, just slightly differently – and do that often. In short, this song is neurosis. No climax, no resolution, just thinking in circles. Which is interesting, because (a) again, this is a band on top of the world (these aren’t the wounded men of St. Anger and Death Magnetic), and (b) it’s a perfect representation of its subject matter. I don’t know if Metallica intended to write a “a song that doesn’t rock”, but this sort of uneasy rumination is familiar to anyone who’s tried to get anything done in court. The repetition and complexity is Kafka-esque. Add a backdrop of suits and money, and you have a lot of going nowhere in a grand setting – just like this song.